Where is Neptune Beach Florida? Neptune is located in the northeast region of Florida and was originally part of Jacksonville Beach. This very private, lovely beach was probably named after Neptune, the god of the sea (according to Roman mythology). 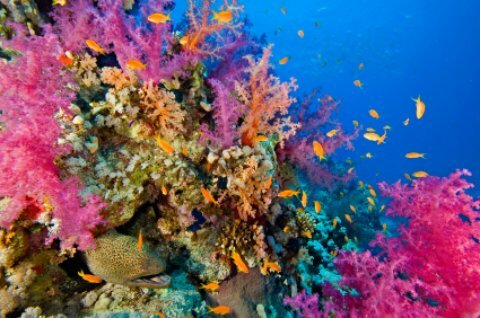 can be seen around reefs by scuba diving and snorkeling. Closed off from the rest of the world, this superior relaxing safe haven is awaiting your visit. You may get even get to enjoy this beach all to yourself. The beach is sought out by tourists who are looking for complete relaxation and solitude and serenity. Maybe your therapist will write you a prescription. This is, indeed, the beach to do nothing but contemplate the floating clouds in the sky. The entire city of Neptune Beach is only 2.5 miles long and the beach is only half a mile along the A1A. If you're curious what life is like in a small, quiet beach town, it’s worth a visit. If you also prefer to have the beach mostly to yourself, you’ll love Neptune Beach Florida. When you have recharged your batteries, head on over to Jacksonville for some excitement. There are three more lively beaches there if you are in the mood for a little more human contact. Now, here's....... Jacksonville Beach Florida. Play a leisurely game of golf at one of the great golf courses here, such as the TPC Sawgrass or Cimarrone. Experience “virtual golfing” at Inside Inside Golf, Inc. consists of playing simulated golf games so you can work on your game as much as you like. Take a ride on the King Neptune, a deep-sea party boat that takes you on deep-sea fishing day trips. Kids of most ages: Take a horseback riding lesson and experience beach riding among the dunes of Northeast Florida beaches at Sawgrass Stables located in nearby Ponte Vedra Beach. Sleeping: For a surprisingly inexpensive and cozy stay, try the Seahorse Oceanfront Inn. There’s also a Days Inn located in Neptune Beach.